this is my very first appearance in Fashion Magazine! I was among these beautiful ladies, for the 'EKSPLORASI HIJRAH' slot. We are representing women in hijab coming from different backgrounds. From left; Siti Shahrizah @ Eja is one of the top actress mewakili bidang lakonan, Sharifah Anis Al-Idrus mewakili peragawati, followed by me in RED, Naa Kamaruddin as a businesswomen, the GLAMpreneur and last one is Jezmine Zaidan the owner of The Old Blossom Box Store, seorang penata fashion. InTrend August, the 100th issue now! Now, we are still in july, so if you are trying to find it from kedai runcit or small shops near you, it might not be available yet. 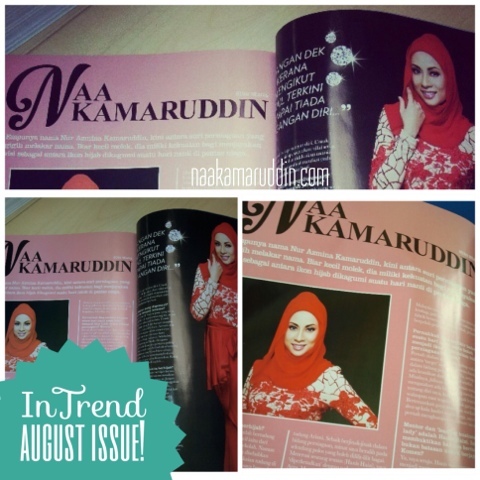 But, so far i can find lots of copies for August issue at Kinokuniya bookstore at KLCC. Read more on me at page 136 and 137..